Chilean President Michelle Bachelet has paid an emotional visit to the place where she was tortured in the 1970s. She was held at Villa Grimaldi, a detention centre outside the capital Santiago, with her mother in 1975 during General Augusto Pinochet's rule. 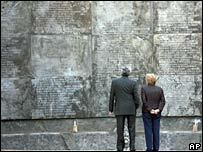 The site is now a peace park and memorial to the thousands of prisoners who were tortured by the secret police. Under General Pinochet's government about 3,000 people were "disappeared" or killed for alleged communist links. 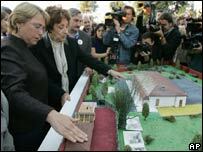 As she toured the park, accompanied by her mother Angela Jeria, President Bachelet spoke of her painful memories. "They are moments of sadness that I feel, looking back to these times of terror. But the most important thing about this visit is to focus on life, freedom, dignity and peace," she said. In 1975, when she was a young medical student, Ms Bachelet was taken, with her mother, to Villa Grimaldi. While she has generally played down her past as a victim of the military government, she wrote in an autobiography that the two of them were separated, often blindfolded and physically mistreated. After several weeks, they were freed and went into exile in Australia. Her father, an air force general, was arrested by Gen Pinochet's government for opposing the coup which brought the military to power and died in prison. "We were the privileged ones because we were lucky enough to survive...Thousands of Chileans, among them my father and so many other loved ones, did not survive prison or torture," President Bachelet said. Ms Bachelet said her government would act soon to try to repeal an amnesty law passed in 1978 which has held up attempts to try those responsible for abuses. Since Gen Pinochet left power in 1990, right-wing parties have blocked efforts by the Chilean Congress to repeal the law. The former leader is currently facing a series of human rights charges related to his time in office. Last month, a court stripped Gen Pinochet of the legal immunity he enjoyed as a former president, clearing the way for him to be charged in connection with kidnapping and torture at Villa Grimaldi.